For centuries, the nearby village of Thurlstone had been more populous and important than Penistone before the gradual decline of its textile cottage industry and the greater employment opportunities which Penistone attracted with the arrival of the railway and the later steelworks and other industries. There had been several mills in Thurlstone on the river Don for textile, vegetable oil or grain processing. The Subsidy Rolls (Poll Tax) of 1379 recorded 33 people in Thurlstone but only 12 in Penistone at that time. Denby (or 'Upper Denby') had 25 people in the Subsidy Rolls. The Hearth Tax returns of 1672 listed only 28 householders for Penistone compared with 65 for Thurlstone and 23 for Oxspring, although it would have under-reported the dwellings of the poor. Penistone '... consists of one wide street, in which are a few neat houses; but it is now a place of no trade, though the linen and woollen manufactures extend into some of the out-townships of its extensive parish.... The market, held every Thursday, is of small importance.. The township of Penistone contains only 703 inhabitants ..' ... and so on. But Penistone does have some historical value and has grown steadily over the years to eclipse Thurlstone in importance. There is also a hint of ancient history in the area, with fragments of an ancient Saxon cross in Penistone Church. On the moors a few miles away can be found earthworks from the time of Stonehenge and part of a Roman road. Penistone goes back to before the Magna Carta ("Did she die in vain?") and both Penistone and Thurlstone were in the Domesday Book. Some houses and farms in our area are several centuries old. Our fine medieval church had used building materials from an earlier time. Part of an old Saxon cross can be found embedded side-ways on in one of the stone pillars near the pulpit. Possibly for several centuries, it is likely that the early Christian worshippers from a scattered community had gathered together as a focal point worship around this cross on top of the hill, where the church would be built in the 13th century. The church tower dates back to the 1500s, at about the same time as the similar tower of Silkstone church was also built. Penistone Grammar School can trace its roots back to 1392, although, according to old sources, the paperwork was lost to prove the point. It started in the church then continued in a building on Kirk Flatts (somewhere near JT Smith had a furniture shop) which was rebuilt at least once before the school moved to Weirfield, near the Netherfield chapel. 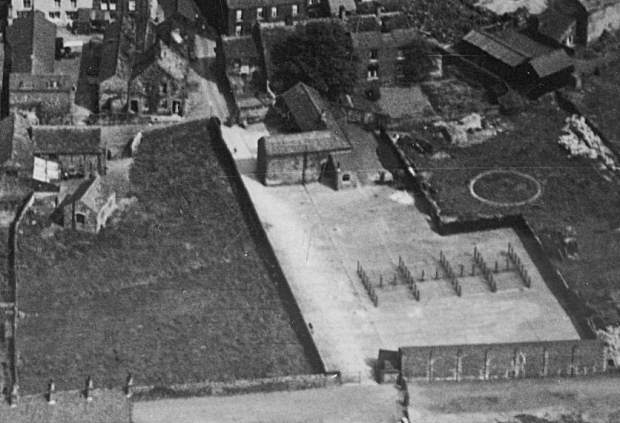 Its current location is now on the site of the former Workhouse, lower down the hill than the old Weirfield site. As with all pages on this website, you can return to the next level above by clicking the 'Back' icon at each page bottom. These sections contain snippets of information from many sources and there are some old photographs which have been 'donated' (scanned and returned) through the goodwill of local people. Many of my own pictures have been posted on the local Archive Group's Facebook and this is welcome but please be kind enough to attribute them to their source. The 'History Timeline' is a collection of historic snippets collected from a wide range of sources. It concentrates on local, rather than national, happenings. Consists of Six footless, swift-like birds on a red background. It was thought that swifts never landed and did not have feet. The feet are shown as tufts of feathers. Consists of: A fly, a flea, a magpie and a flitch of bacon. An' soa, my lads, will a Yorkshireman. An' soa an' all, can a Yorkshireman. No more is a Yorkshireman, don't ya see? Steel had been an important industry in this area since the mid-nineteenth century but is steadily declining in recent times with much of our manufacturing going abroad. This led to savage job cuts from time to time. Penistone had extensive railway sidings for the old Cammel Laird works which later became David Brown's foundries, after a five-year gap in the 1930s. 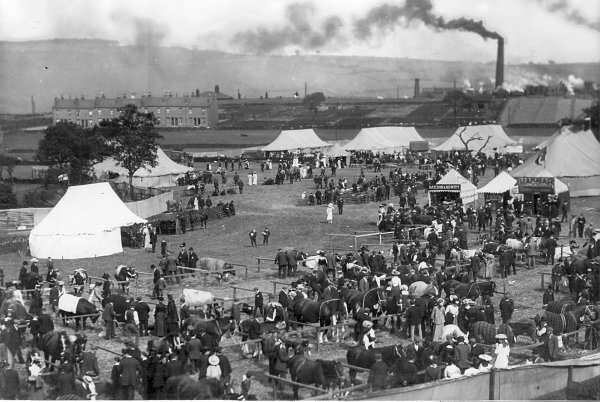 Take a look at the Cubley link above to learn about a 'Model Village' for steel-workers which never reached fruition. David Browns' foundries lasted many years and its long, red-brick wall, would have been a familiar site to pupils walking to Spring Vale school. The wall has now been demolished to make way for new houses and other houses have been built on part of the 'Hitec' site. 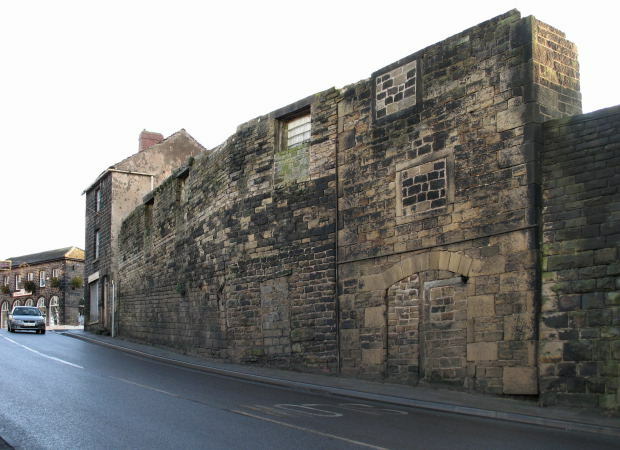 The other major steelworks in the area was Samuel Fox's, a few miles away in the badlands of Stocksbridge. Anyone living in the Penistone area a few decades ago would remember the sky going red over Stocksbridge. This later became British Steel Company (BSC, aka 'Billy Smart's Circus'). Then British Steel merged with Hoogovens and created the Anglo-Dutch company CORUS, registered in the UK and run by British people (it was a takeover by any other name). At this time, I don't have pictures to illustrate the local steel industry. Gittus railway wagons factory was also an important Penistone company. Winterbottom's of Oxspring produced specialist wires in their wire mill. It was said that they produced special wire for NASA's space shuttles. It became known as Wintwire after a management buy-out. Now the site hosts John Donnachie's building company and several smaller industrial units. The Cubley Brook vinegar brewery at 'Vinegar Bottom' is fondly remembered in the area. It started out as a beer brewery and maltings but later provided vinegar for many well-known brands. Now there is no trace of the brewery. The final indignity was for its horse-trough to be obliterated by builders in 2006-7. The main local resource is Penistone and District Community Archive, which is based on the great work of the late Neville Roebuck, who amassed a huge amount of historical materials. The archives were eventually found a home in the Community Centre and can be visited most Market Days (Thursdays) in the Community Centre from 10am to 1pm. Most of the material is on paper but there is material on computer and DVDs. The whole caboodle is looked after by the Penistone History and Archive Group, which has a thriving Facebook presence. It's worth joining Facebook just for that (and CAP). They have history talks with guest speakers every first and third Wednesday of the month in the Community Centre. Barnsley Council has a museum in Barnsley Town Hall and some of Penistone's historic materials have found their way there. However, given that BMBC must have amassed a huge amount of material from the Borough and will have limited space to exhibit them, we can be sure that most of it is in storage and unseen by the public. As such, we can't request to see what we don't know about. Also, we do know that the deeds to Penistone Town Hall were sent to Barnsley around 1974 and cannot be found after extensive searches. That makes it all the more important to keep our local history in local hands. 'Better kept in Penistone than lost in Barnsley.' What Penistone needs now is a much bigger place to accommodate our history, such as a section of the Town Hall building. Looking at other historical resources, the excellent Penistone Grammar School Archive site has 360° views of old PGS buildings, including Fulford Building and the demolished building.. It also has a range of photographs and documents. Please pay a visit to Penistone History and Archive Group, based upon the late Neville Roebuck's collection. It is open 10am to 1pm on Market Days in the Community Centre. 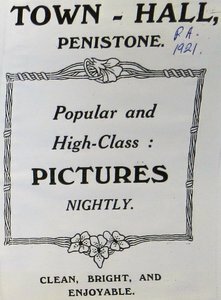 The Stocksbridge & District History Society also has some interesting items relevant to Penistone. The Denby Dale & Kirkburton Archive Collection might be of interest. It has old council minutes and building registers. Also, see the Listed Buildings, bridges, etc. in our area. You might find some local industries in Grace's Guide. A 'potted' history of Britain and Penistone is on Mr Wainwright's website. A few years ago a sound recording archive from interviews with Penistone's old people was being made, possibly by Sheffield University. Nothing more has been heard about this. Genealogy researchers might like to visit the FreeBMD project, which aims to put records of Births, Marriages and Deaths in the public domain, free of charge. These are of particular local interest but some will be out of print. Try Penistone Library, Penistone Church and the local garden centres. A Yorkshire shop in Denby Dale has a good collection of Chris Heath's books, which mostly focus on Upper Denby and Denby Dale but give a rich insight into local life from Anglo-Saxon times, right up to the Industrial Revolution and beyond. A History of the Parish of Penistone - By local historian John Ness Dransfield. This is the great granddad of local history books and was published in 1906. You can download the entire book 'A History of the Parish of Penistone' from the US archive website 'archive.org' in various formats. The pdf is about 52MB. Church Guide Booklet - If you can find a copy, this is gloriously illustrated. It might be found in Penistone Church. English Place-name Society - Take a look at some large pdfs which look at East and West Riding place-names, among many others. Stories of the local fallen of the Great War (see also CWGC). Published in the centenary year, 2014. Available in local shops or via Janet Dyson, Tel. 01226 765093. See also Pen Memorials. The Stories behind the Names (Penistone War Memorial 1914 to 1919) - By Janet and Rex Dyson, with Penistone Historical Society/Archive and others. The Fallen, Their Stories (Thurlstone and Hoylandswaine, 1914 -1919) - By Janet and Rex Dyson, with Penistone Historical Society/Archive and others.